After 12 long days of adventure, our tour of Eastern Europe is over. We’ve experienced countless new things, and there’s quite a bit to reflect upon; I don’t think I can adequately express all of the emotions that are running through my head right now. But a picture is worth a thousand words, so perhaps they can aid me. I’ve chosen a number of my favorite photos that I took throughout the trip, and I’ve written a bit about each of them. 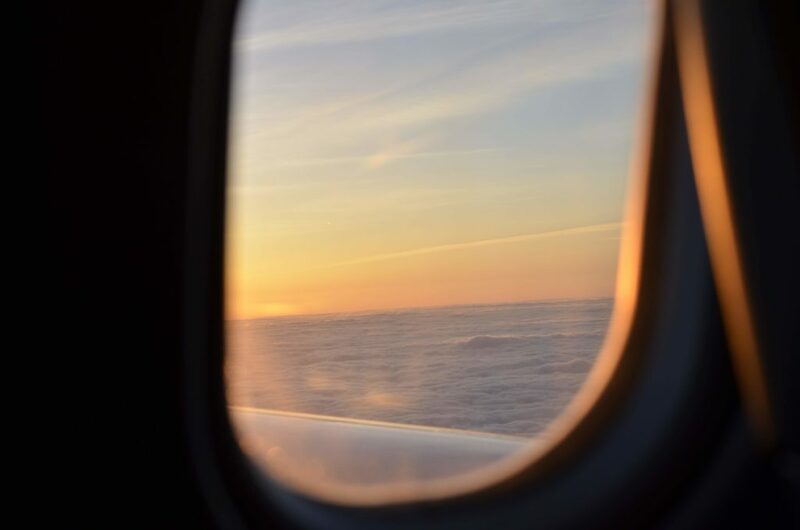 As we descended into Amsterdam, I opened the window to find a breathtaking sunrise casting its soft light onto the bed of clouds. Adventure awaited below, but I had already had one of my own in the sky– I’d been seated next to a stranger. But as Maestro said, “If you wanted it to feel like home, you should’ve stayed at home.” I played Mario Kart with her. As soon as the flight landed in Berlin, we began touring. Of all the brutalist architecture and old imposing Nazi buildings, the Reichstag stood out to me the most. It houses the German parliament. 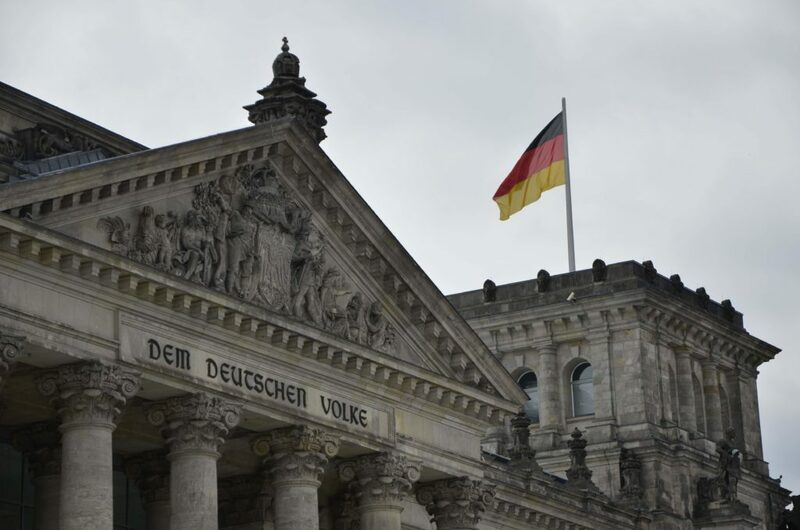 “Dem Deutschen Volke.” “To the German People”– a dedication to those they serve, and a remembrance to when they didn’t. 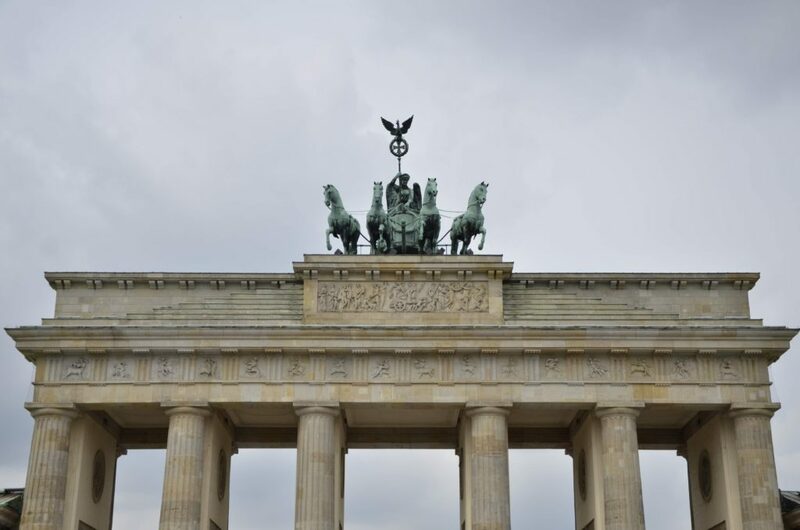 Berlin treats its history in stark contrast to the way we do. Remnants of war still stand to provide continual reminders of the past, urging reflection upon ancestors’ actions and consequences. A quadriga sits atop the Brandenburg gate. This gate has seen much history, from Napoleon to Kennedy. It stood once as a symbol of Nazi power, but now stands as a symbol of unification. Its current symbolism, to me, is the most powerful. The same year the Berlin wall came down, Leonard Bernstein led the Berlin Philharmonic in Beethoven’s 9th Symphony, but with the word Freude (joy), replaced with Freiheit (freedom). Fitting that we visited during Bernstein’s centennial. The next day, we attended a Berlin Philharmonic concert. On the program was Leonard Bernstein. Next, we crossed the German-Polish border and visited Wrocław (pronounced vrotswav, for those uninitiated in Maestro’s language classes). The Market Square was surrounded by colorful medieval architecture, just as shown. 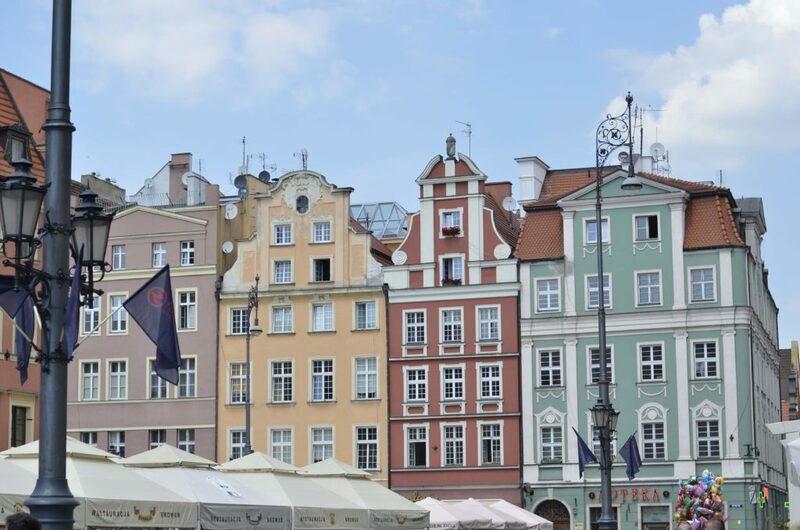 Juxtaposed with the old façades were modern businesses and bustling crowds, acting as a symbol of the duality of Poland’s cities and culture, which many of us have never considered. In Lusławice, the Penderecki center welcomed us. Those of you who are reading this have probably already seen the unmistakable modern architecture of the center. But as beautiful as it is, I’d like to focus on its surroundings. 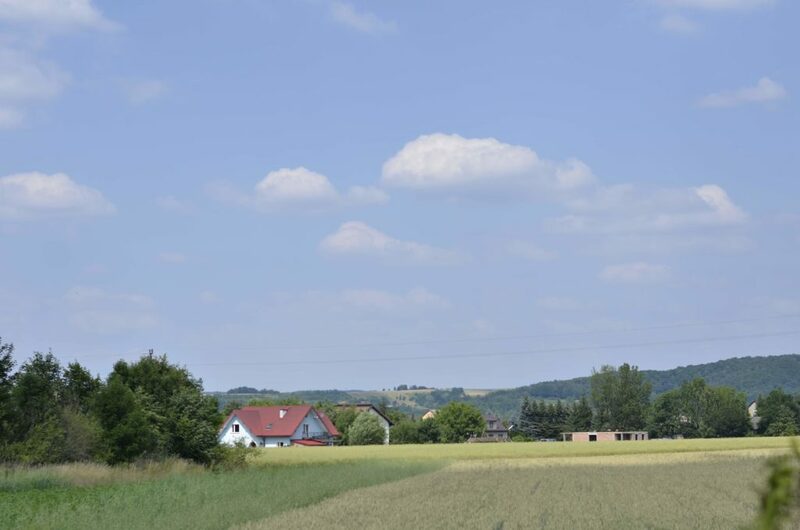 Lusławice is a village of 920. It’s located quite literally in the middle of nowhere, deep within Polish countryside. On our way there, winding roads got our bus lost. But despite its isolation, despite Poland’s loss in the world cup game on the same day, our concert at the center brought a quite nearly full audience. I think that that just goes to show that music truly brings people together. 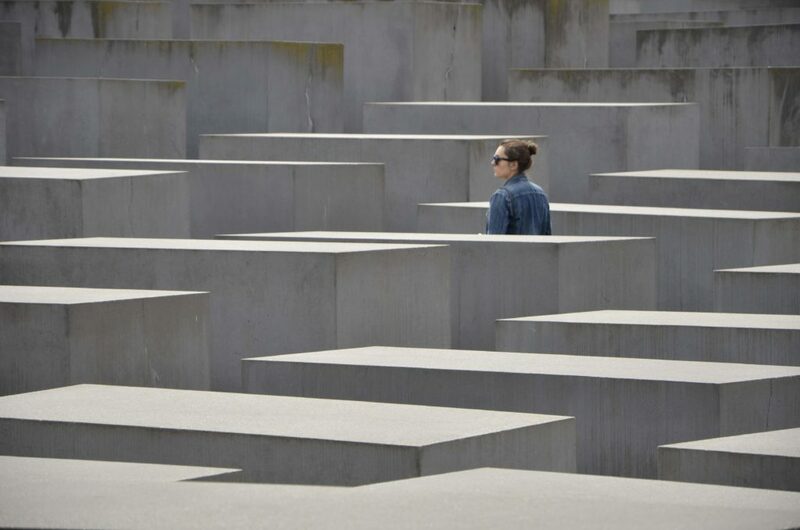 This photo was taken at the Memorial to the Murdered Jews of Europe in Berlin. A woman walks through the concrete blocks that stretch on for what seems like forever. While we stayed with Penderecki, we visited Oswiecim, better known as Auschwitz. It was a sobering event. What happened in Auschwitz was despicable. But the truth stands imposing, immovable, unchanging, and we can only try to navigate what it really was. 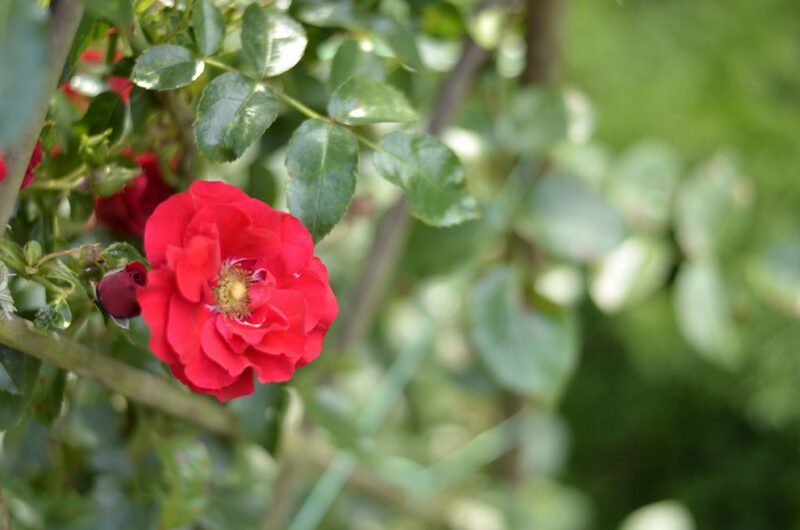 This is a photo from Penderecki’s garden. I think of it as his reminder to us to bring beauty into the world wherever we go, through music, gardening, or any other means available. 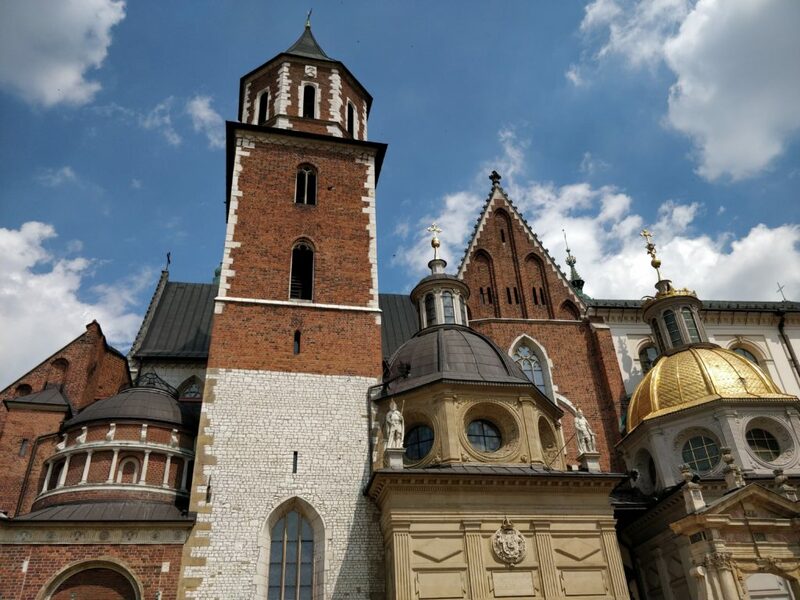 We visited Krakow too, and this photo of the Wawel Castle displays what I find most intriguing– the varied architecture, from different eras, different styles, and different kings coming together to form one cohesive building. After an admittedly sad departure from Lusławice, we headed south to the tourist town of Zakopane. 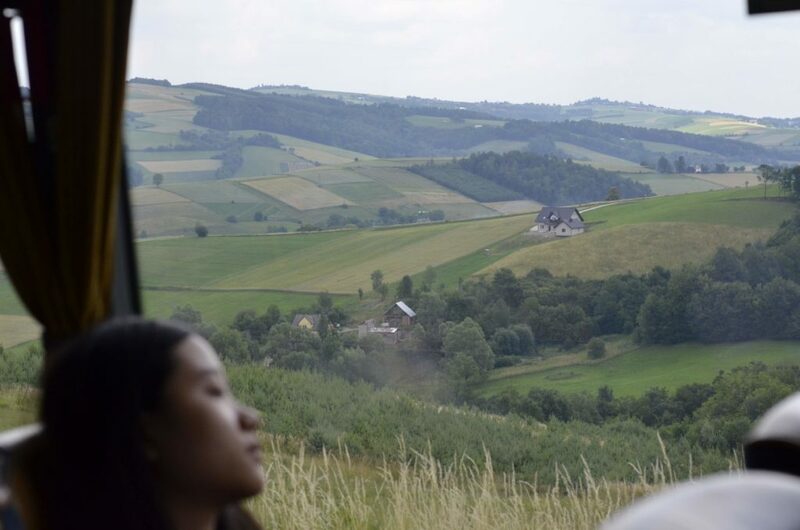 On the way, we looked out the bus windows at picturesque Polish landscapes–rolling hills and pastoral homes. I could’ve stared for hours on end. 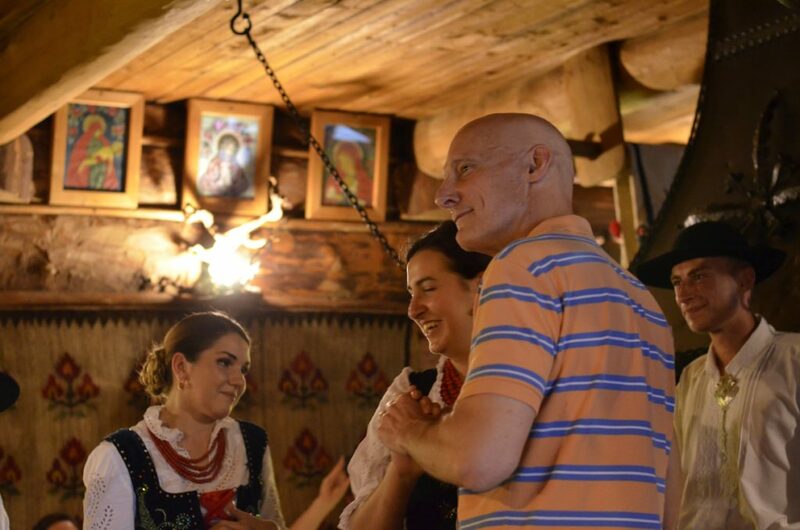 The dinner in Zakopane was memorable. Traditional music and dancing filled the room, and Maestro joined too! We were served copious amounts of food. After three courses, I was about ready for dessert. But then a fourth came, larger than the previous three combined. I tried, and I failed. I believe that many other Symphony members can attest similarly. I also believe that we will all remember the dance with the axe clinking, too. 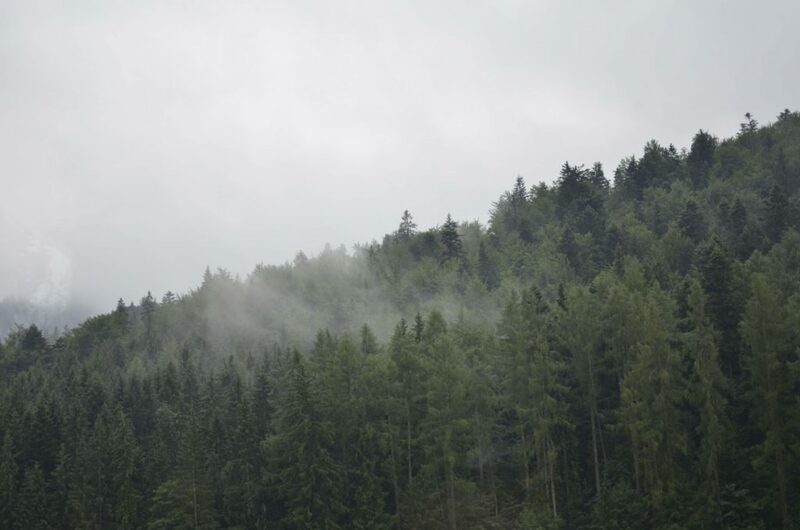 After a fun night in Zakopane, we drove through Slovakia. There was a noted difference between the lively streets of Zakopane and the seemingly decrepit buildings that dotted the small Slovak villages we passed through. But nonetheless, rustic Slovak scenery deserves space on this blog too. 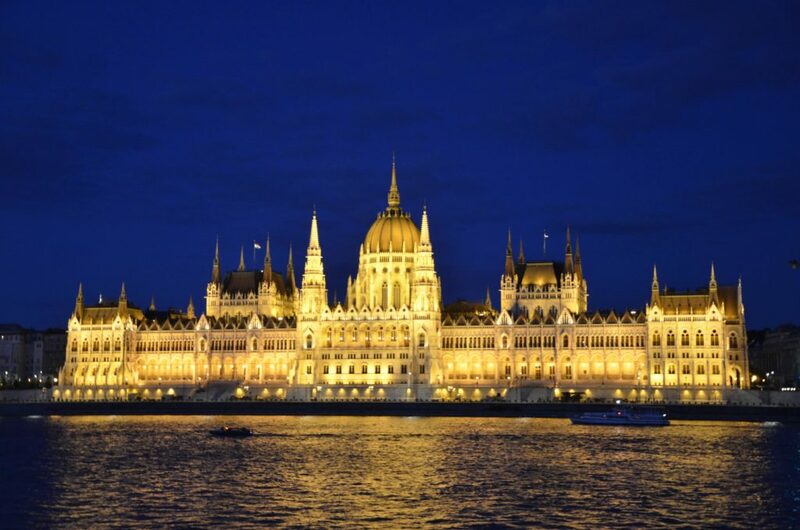 After arriving in Budapest, we toured the Danube on a river cruise. Scenic photos and makeshift photoshoots ensued. 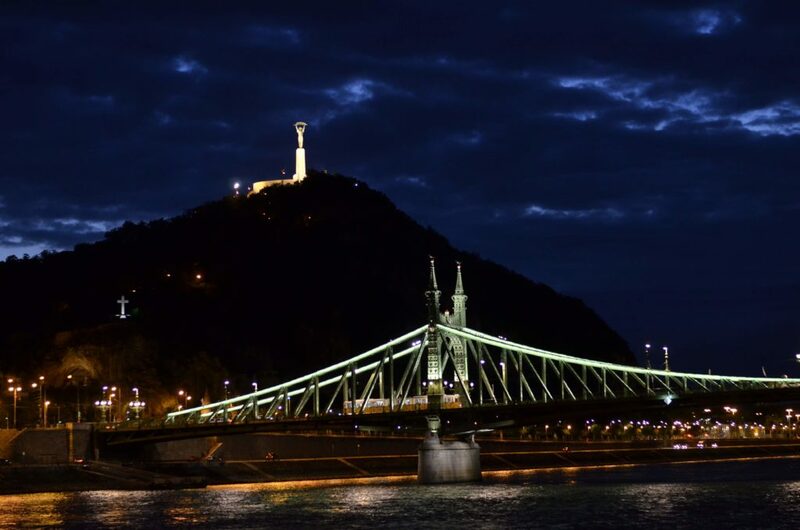 Pictured here is the Liberty Bridge (Szabadság híd) in the foreground, and the Citadel (Citadella) in the background. As striking as these scenes are, I found something else in Budapest more striking– the Hungarian language. The transition between Polish and Slovak was apparent, as the letter v began appearing in storefronts (Polish does not use the letter v), but they are nonetheless related. Dziękuję morphs slightly into Dakujem. But Hungarian, despite being so physically close to these linguistic neighbors, shares no resemblance whatsoever. It is a linguistic island; it’s closest relatives are Finnish and Estonian. To me, this is living, changing evidence of Hungary’s rich, interesting, and unique history– more powerful than any statue, in my opinion. 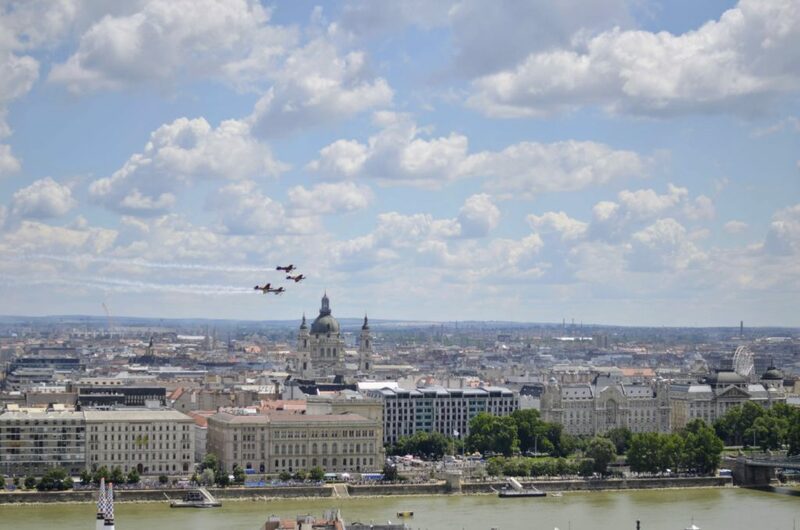 At the Fisherman’s Bastion (Halaszbastya) we gazed in awe with other tourists and locals as the planes spiraled through the air above the Danube in an airshow. As we were watching, something struck me. There wasn’t a skyscraper in sight. In such a large city, why wouldn’t there be? After some research, I found that Budapest’s legislation requires that all buildings be shorter than 96 meters. That number– 96– is symbolic. 896 is the first year that the Magyar people established a kingdom which became Hungary. Both the St. Stephen’s Basilica (shown) and the Parliament building are 96 meters tall, emphasizing the equal importance of both religion and government. In Szentendre, a tourist town nestled in a bend on the Danube, we were given much appreciated free time. 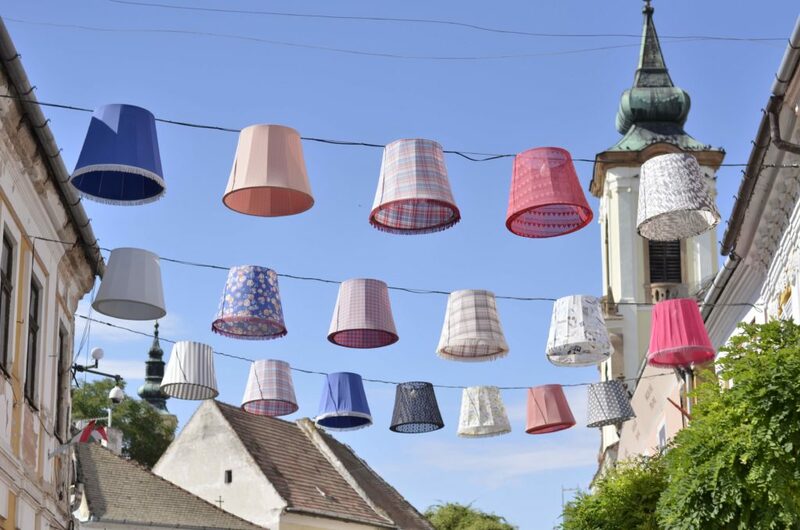 These lamp shades hung above the busy street. I, as well as many others, was drawn into the tourist shops lining the winding streets. We wanted to experience Budapest for what it was, so we rode the subway to Batthyány tér, the closest stop on the opposite side of the river. We got off, and immediately saw the parliament building (Országház), in it’s amazing gothic glory. An emotional farewell concert followed the next day. Gabi, our native German tour guide, was amazing. She was unabatingly lively, diversely knowledgeable, and incredibly well-spoken. This photo, taken at 3 am, is simply a snapshot of all of the time and work she has put into our tour. 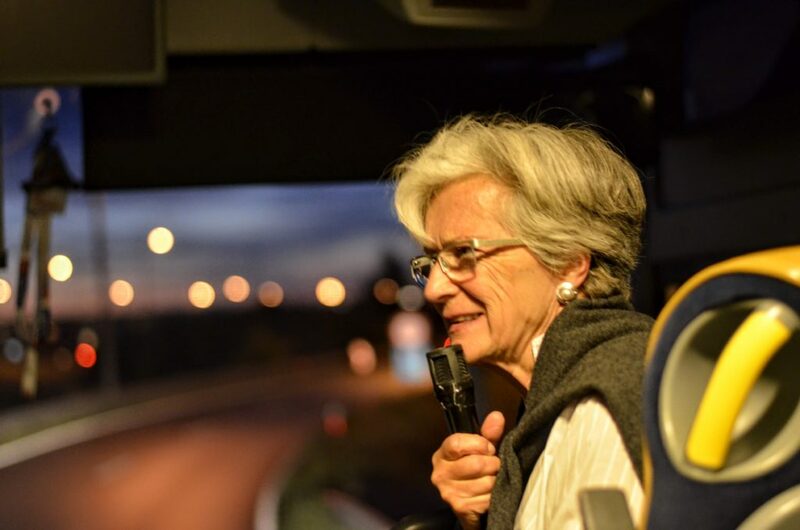 She spent countless hours sitting at the front of the bus with the microphone, delivering to us little tidbits of info about the places we were seeing. I’m sure I used some of that knowledge in writing this post. Bus 1 thanks you, Gabi. 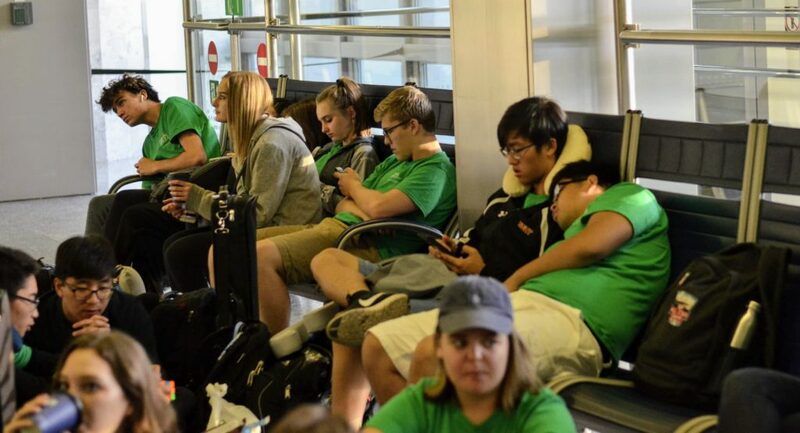 As we waited for our flight, tired and ready to sleep, it finally hit me. It was over. One flight later, and all of the events and adventures from the past ten days would just seem like a dream. 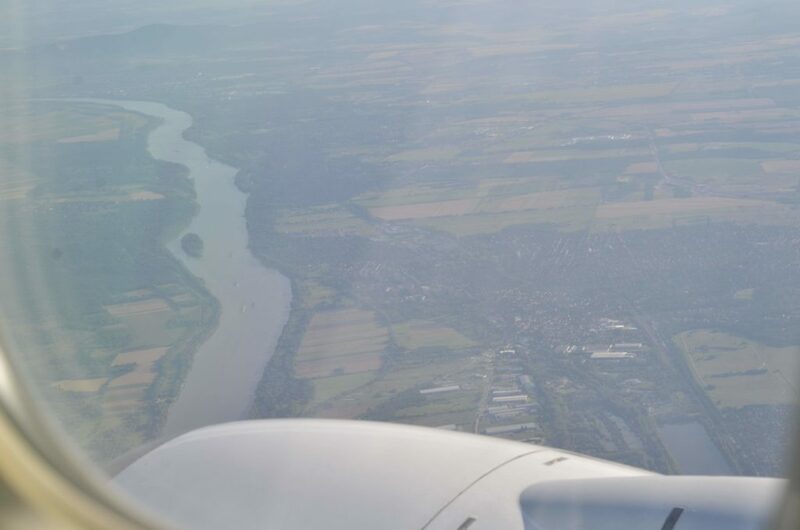 A final glimpse of Hungary as we departed. I am infinitely grateful to those who made this tour happen– Megen, Miranda, Maestro, and all the people working behind the scenes whose names I don’t know. I’m also incredibly thankful for all of the friends I’ve made through GTCYS. Whether I’ve known them for all 4 years of my GTCYS career, or I just began talking to them during this tour, they made this whole experience all the better– and the memories we’ve made together will last us a lifetime.